Hello there! Sorry it's been a while. For an unemployed person, I've been very busy. Between applying for jobs, I have been cleaning and fixing and getting rid of everything that has been wrong with my apartment and life for the past year. Damn, I love being unemployed. I wish I did not also love money. I've been working on a big craft project, which is revamping a beat up sewing desk I got on Craigslist, but since that's not done, here are some cute coasters! 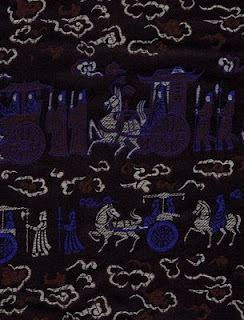 Okay, style question: I'm thinking about making matching placemats using the denim fabric and this poly brocade - what do you think? 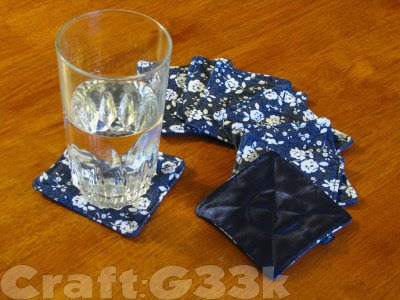 One more question: Does anyone know of a tutorial for making a fabric box that I could store these coasters in neatly? Alrighty, thanks for listening! *In fact, I fully reject the notion that you should immediately get rid of scraps. Scraps are awesome; most of my projects use scraps in some way. I keep them neatly in a clear plastic bag. Wow, thanks, those look awesome!